Hot this week: Culture crime news returns from Mexico. I’ve released these photos of mine under a creative commons license in hope someone can put them to good use. Very few details but it appears as if Nazi militaria was targeted. The book was taken from a locked cabinet at the International Book Fair in Bogota and was found later at a used book stall. Three old bells were stolen from the church of San Cristóbal in the village of Holcá, Yucatán. Churches in Veracruz are preparing inventories of all sacred art within churches to aid in theft recovery. Several bundles left by looters fleeing the site of San Antonio were found to contain artefacts and mummy parts. Despite rumors and strange eBay listings, the collection of this closed museum has not been stolen or sold. Does Robert Gentile of Connecticut know where the paintings stolen from the Isabella Stewart Gardner Museum are? Portrait of a Man by Giovanni Battista Moroni which has been in storage in the Louvre since 1951 has been returned to heirs. Three artworks taken by US soldiers from Dessau return home. Not a surprise that the man accused of knowing something about the Gardner theft would say he doesn’t. Also not guilty to other charges. A recent return of a painting to an heir will revitalise restitution efforts, this article states. A discussion of the possible sale of artefacts produced by Japanese American victims of American concentration camps and other physical objects of oppression. You could ask the same about looted antiquities. The answer is quite obvious. The Roman pottery had been excavated at the Abby and was on display at the museum. After a decade, none of the 13 works have been recovered and thus folks are speculating they are being used as ‘collateral’, although there is no evidence for this. Called Operation Icarus, police have recovered about £250,000 worth of sacred art stolen from churches around the UK. The monks remains are believed to have been stolen from a village in the province of Fujian. 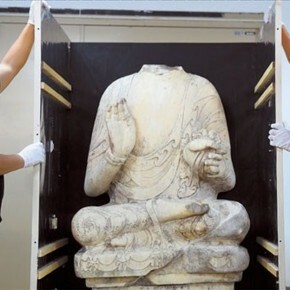 The headless statue is in China’s Hebei Province. The head was taken in 1996 and returned to a temple by a private collector. The head is believed to have been stolen from a temple in Hebei province (as the body is still there). Oscar van Overeem, who says he bought the mummy stolen in 1995 sometime in 1996, has agreed to return it to Yangchun village. A good read on the politics of what happens to Indian antiquities after they are smuggled. S. Vijay Kumar asserts that simply having a few stolen idols returned isn’t enough, India must investigate antiquities trafficking cases. Interesting details in the article. One of the idols has been identified as stolen from a particular temple. The other has not been IDd. The badly damaged Swayambunath temple will receive devotees for Buddha’s birthday despite fears that small statues may be taken due to insecurity following the earthquake. Discussing the post-earthquake insecurity of sacred sites. The building is unstable and the permanent collection has not been recovered yet. The museum official quotes notes that these works of art are the oldest that Nepal has because they rest has been looted, smuggled, and sold out of country. A number of objects are missing from the Rato Machindranath temple in Bungmati including a renowned bhoto, a jeweled vest. It is presumed they are in the rubble of the temple but there are suspicions of theft. 1200 artefacts seized in Italy and Germany have not been returned to Pakistan. The provincial government has done little to recover them. Coming out of a corruption investigation by the Administrative Control Authority, little details have emerged on this case. There is now a media gag in place regarding this case which involved police officers and other officials. A robbery at the L.A. Mayer Museum in Jerusalem in 1983. Article about anti antiquities smuggling efforts in Lebanon and the UNESCO #UniteForHeritage hashtag. This is coming from the state news agency. Specifically 69 of the pieces they are claiming have been reclaimed were returned from Lebanon.